We’ve all suffered the sudden, all-encompassing horror of a dead phone. The accusing looks and hushed criticism of shunned family and friends. That blank screen on the commute home that leaves you at the mercy of your chatty fellow traveler. The sudden loss of Google Maps as you turn into an unfamiliar neighborhood. The sinking feeling as you realize your phone alarm didn’t go off because you forgot to plug it in last night. Why oh why, must our smartphones die? We feel your pain and that’s why we’ve been checking out some of the best external chargers on the market. Until there’s a real breakthrough in battery technology a portable charger might be the best solution. We’ve got something here for you whatever your needs may be, from a bucket load of power for a camping trip, to a pocket-friendly top-up for the daily commute. These are 30 of the best portable chargers that money can buy. Tap the small button on the side, and the four tiny LEDs light up to show remaining power. It doesn’t support fast charging, though, and we found that it took a couple of hours to charge the large battery in the Samsung Galaxy S7 Edge. Fortunately, it should fully charge an iPhone in around an hour. The input for charging it is 1.5A, so it takes a while to fully charge, but it does support pass-through charging, so you can plug it into the wall and your phone at the same time. If you like the design, but you need more power then check out the 10,000mAh Flux Charger Plus for $60. This versatile charger has three output ports. There are two USB ports, both rated at 2.4A, but one of them supports Qualcomm’s Quick Charge 3.0 technology. There’s also a USB Type-C port that can deliver up to 3A for your laptop, tablet, or phone. There’s a big power button up top with four blue LEDs to show remaining power. Not only can it charge devices with QC 3.0 or USB Type-C, it can also be charged by either, which means it’s very fast to juice up. You get two tangle-free USB to Micro USB cables in the box, but, unfortunately, there’s no USB Type-C cable in there. It also comes with a soft, mesh bag sporting a drawstring closure. It’s not the most portable device in the world, but it’s impressively compact and light for the capacity. This is a good solution for travelers with multiple gadgets. You can expect at least five full charges for an average smartphone, and it can even charge an iPad Air with change. If speed is important to you and you have devices that support Type-C or QC 3.0, then this is a must-have. This is easily one of the most attractive power banks we’ve ever seen. The frame is a soft, black plastic with an ebony layer on the bottom and an eye-catching top panel. Carved offers a wide range of different finishes, some of which consist of plain wood grain, some with fantastic designs by talented artists, and some that mix natural wood grain with splashes of colored resin. In terms of functionality, the Carved power bank is really straightforward — you get enough power to fully charge a smartphone at least once, delivered via a single USB port that’s rated at 2.1A. All the connections and components rest at one end, including the USB port used to charge your phone, the MicroUSB used to charge the power bank, the recessed power button, and a standard LED array that indicates how much juice is left. The charger also comes with a handy burlap sack and a short MicroUSB-to-USB cable. This power bank offers great quality and a good range of features at an attractive price. It’s a chunky, heavy, wee device that’s just under an inch thick, four inches long, and three inches across, so it will fit neatly in your pocket or bag. To make up the 10,400mAh rating it actually has four, 2,600mAh LG batteries inside. It’s extremely simple to use. There’s a power button which brings the four blue LEDs to life, to give a rough indication of remaining power. You have a single USB output and a Micro USB input for charging it up. Both support Qualcomm Quick Charge 2.0 technology, which is fast. If you have a charger that supports it, then you can actually charge this power bank up to 60 percent in just 30 minutes. The output is smart enough to determine what you’ve plugged in, so it can cover 5V/2A for universal devices, 5V/2.1A, 9V/1.8A, and 12V/1.35A (QC 2.0) for Android devices, and 5V/2.4A for Apple devices. You also get a Micro USB charging cable in the box. You can expect around three speedy, full charges for something like the Samsung Galaxy S6 from this power bank. If you want enough power to keep your gadgets going for a week in the wilderness, then this rugged power bank from ZeroLemon could be right up your street. It’s very big and heavy, but that’s the price you pay for a 30,000mAh capacity. It’s also designed to cope with the outdoors, so there’s a dual-layer plastic covering to absorb shock and port covers to keep dirt out, but it won’t cope with the wet. It’s capable of charging up four devices simultaneously with a combined output of 6A divided into 2A/2A/1A/1A. You’ll be able to charge up an iPhone 6 or 6S around ten times, a Galaxy S6 about seven times, or an iPad Air a couple of times. There’s a round power button on the top with four LEDs built in to give you an idea about the remaining power. You only get one Micro USB cable in the box, but there are actually two Micro USB ports to enable you to charge this up faster, which is a good thing, because it can take 24 hours to charge with a single charger. It’s not going to suit everyone, but for a family or a group of friends on a camping trip, this could be ideal. 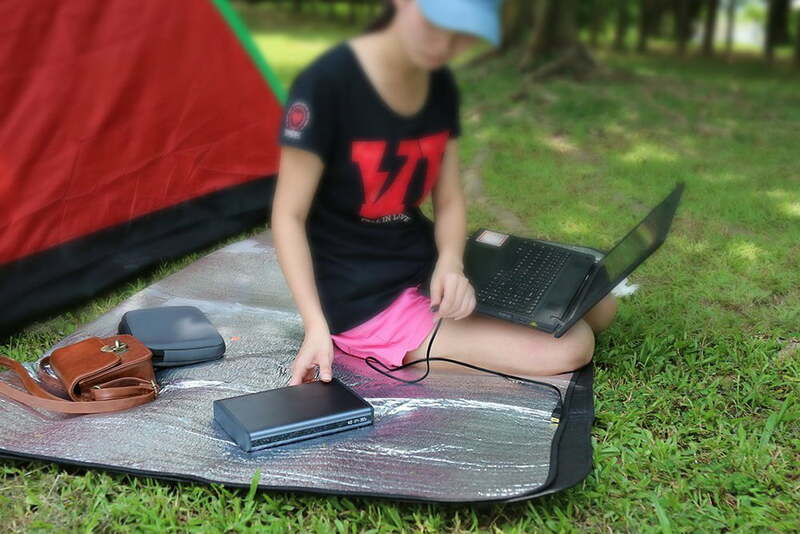 If you’re looking for a rugged solution you can take camping and to the beach without fear, then this is it. 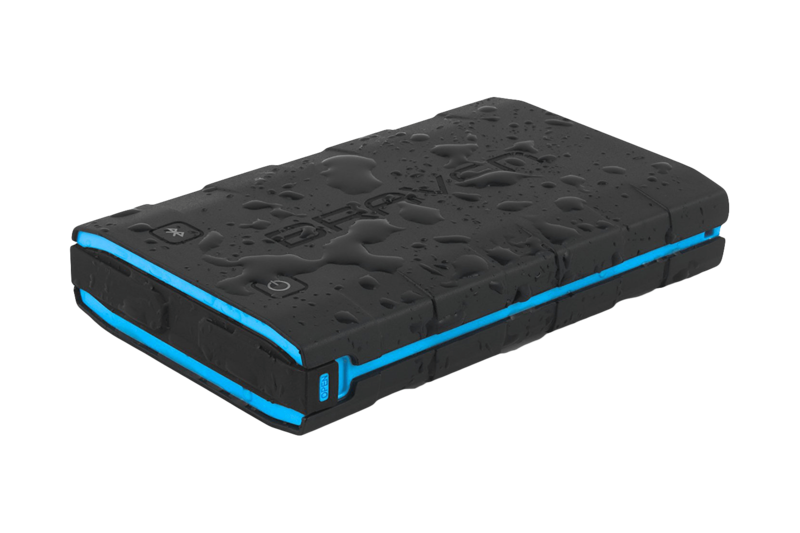 The BRV-BANK from Braven scores an IPX5 rating, which means it is water resistant, and it meets military drop test standard 810G, which means it can survive a fall unscathed. It also has a high-quality, 6,000mAh battery which comes close to delivering the stated power. You can expect at least two full charges for the majority of smartphones on the market. It’s not just tough, though, it’s also smart. You can install the free BRV-BANK Remote Battery Monitor App and use it to connect via Bluetooth. It will give you an accurate readout of remaining power, allow you to remotely turn ports on and off, and activate “Bear Mode” which triggers an alarm and makes the flashlight strobe when you move your phone. You can also use the alarm to find the battery, or activate the convenient S.O.S. mode when in a pinch. It also comes bundled with a rugged USB to microUSB cable, a lanyard strap, and a nifty USB flashlight attachment that emits 100 lumens. There’s a power button and a Bluetooth pairing button on the BRV-BANK, and a five LED display to indicate remaining power at-a-glance, without resorting to the app. It’s tough, reliable, and feels well-made. You can pick it up in black and blue, or grey and red. This incredibly small, stylish portable charger is the second release from LinearFlux. It looks gorgeous, with angular black plastic, framing a metal panel in gold, silver, or titanium. It’s only 89 x 58 x 14 mm in size, which makes it seriously portable. It’s also very fast-charging, if your device supports it, offering up to 3A output. You can charge two devices at once and HyperFET circuitry inside automatically decides which device needs more current, with an overall limit of 3A. It comes with built-in cables, a full-sized USB can be pulled out one side to charge up the Lithium Card Pro, and on the other side you’ll find a pull-out microUSB or Lightning cable, depending on what you chose. There’s an extra USB output on the bottom, and a microUSB input with a small power button up top. A thin strip beneath the central logo comes to life as a white light when the power is turned on. It flashes when charging is in progress, turns blue when it drops below 90 percent, and then red below 10 percent. 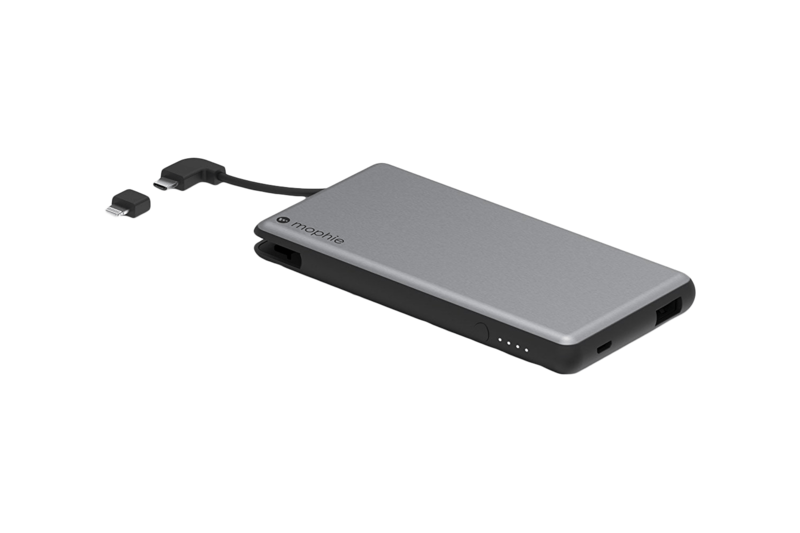 The Lithium Card Pro can also serve as a syncing cable to backup data when plugged into a computer or laptop, and it will charge itself and your phone simultaneously. You can expect at least one full charge for your phone, and this will happily charge other devices, including the Apple Watch. You can also find the original, more basic Lithium Card for $40 on Amazon. This pouch is a smart idea. It comes in Android or iOS flavors, with a built-in Lightning cable or a microUSB cable. The battery is sealed within a zipped pouch, and there’s a pocket in the front into which you can slide your phone alongside the main 2.1A charging cable. There’s also an elastic closure to keep it safe and secure. If you open the zip there’s a built-in USB cable for charging it up, rated at 2A. You’ll also find a backup USB port for charging another device at 1A. On the top corner of the device inside the pouch, there’s a standard four LED display and power button, so you can see the remaining juice. You should get close to two full charges for your phone from the Power Pouch. Here’s a stylish battery pack that’s packed with handy features. The 6,000mAh capacity will be enough to fully charge any smartphone at least once. There’s a built-in cable with a Micro USB connector, but Mophie also includes a Lightning connector that clips over the top for charging iOS devices. There’s also a second USB port for using your own cables and you can charge two devices at once. Charging speeds go up to 2.1A, so there’s no QC support, but it will charge most devices pretty quickly. It does support pass-through charging, so if you plug it in to the wall and your phone, then it will charge your phone first, then start charging the battery pack. There’s a power button on the side and four white LEDs to show remaining battery life. It’s quite a slim device, about the same profile as a smartphone, but a little thicker. The metallic finish comes in space gray, rose gold, or gold. It’s comparatively expensive for the capacity, but it’s well made and has plenty of features. The great thing about this external battery pack is how quickly it can be charged up. There’s a dedicated round port for recharging with the supplied wall charger and if you use it then you can have a fully charged battery pack in an hour and a half. The downside to that is that you need to take the dedicated charger with you if you want to recharge it, which obviously makes it less portable. There’s an LED screen that shows you the remaining power as a percentage, and displays how many minutes it will take to recharge it. There are also two ports, so you can charge two devices simultaneously, one at a decent 2.1A speed and one at the slower 1A standard. It is quite large and chunky, but boasts enough juice to fully recharge a Nexus 7 twice, with change. As a well-known player in the battery case market for iPhones, it should come as no surprise that Mophie also offer a range of external battery chargers. The Powerstation Pro is sold on its merits as a rugged power solution. The case is aluminum and steel with a rubberized bumper in black or orange, scoring this charger an IP65 rating, which means it’s dust and water resistant. The protective plastic also includes two port covers that flip open to reveal the USB out, and microUSB in. Considering the capacity here there’s no question this is usually really expensive (R.R.P. $100) and quite bulky, but you may be persuaded if you need a tough, reliable solution and it can be found more cheaply at times. It will charge anything you can plug into the USB and outputs at up to 2.1A for fairly fast charging, though charging the Mophie itself using the cable supplied does take a while. As an example you can expect around three full charges for an iPhone 6 from this battery. If you need a lot of juice then this 20,400mAh-rated battery charger has more to offer than just a silly name. You’ll get multiple smartphone charges from this thing, it’ll even fill up an iPad with plenty of power left over. It’s heavy, but it’s smaller than you might expect, considering the capacity, and it has a nice soft-touch rubber finish in black with an orange highlight. There’s a USB port at either end, and the spine plays host to the microUSB port for charging it up, the power button, and the built-in flashlight. It’s a slightly odd arrangement. It also comes with a 2A charger, a microUSB cable, a 30-pin adapter for Apple devices, and a Galaxy Tab connector. You can charge two devices at once, but you might not get the full advertised speeds. The downfall with this is the slow charging time for the charger itself, but it does deliver a lot of power at a pretty reasonable price tag, and the design is good. If you want something stylish that packs plenty of power, then this could be it. The Proporta Stripe showcases a black, soft-touch finish with a metallic frame and power button. Four LEDs light up on command to tell you how much of the 12,000mAh capacity remains, and moreover, you can recharge your smartphone quickly through the 2.1A USB port while simultaneously charging a second device with the 1A USB port. You can expect at least four charges for a Galaxy S5 or an iPhone 6 Plus. The charger is fairly light and slim considering its capacity, but it remains heavier than most smartphones of the same size. It also comes with a standard Micro USB to USB cable, along with a Micro USB port for charging it up, which takes a while. This is a good-looking and solid charger, but it is on the pricey side. This is something a little different. It doesn’t just charge smartphones and tablets from the two USB ports (rated at up to 2.4A with a limit of 4.2A between them). This charger also features a 600A outlet and jumper cables to get your car started when you have a dead battery. It’s also outfitted with four LED indicators, so you have an idea how much juice is left, as well as a built-in flashlight with an SOS mode for signaling others when you break down. Furthermore, the entire package comes in a handy bag that includes a power adapter, a car charger, a USB cable with various connectors, and jumper cables. There’s also a full set of instructions with clear labels. The stated capacity is definitely optimistic, but you’ll still get about two or three charges for an average smartphone. It works pretty good as a jump starter and flashlight, though, there are better options if you’re looking for something purely for charging your devices. The Pilot’s heavily-discounted price is nothing short of attractive. It offers two USB ports, a blue 2.1A port and a 1A port, allowing you to simultaneously charge two devices. It also showcases an aluminum body that’s currently available in three colors, along with a more expensive version featuring plastic covers available barrage of other colors. It’s fairly lightweight, too, and will fit in most pockets. The Pilot charges via Micro USB using the supplied cable, allowing you charge your iPhone roughly three times, or twice if using an Android phone lined with a big battery (i.e. the Galaxy S5). You’ll also the find the familiar, four LED indicator system that lets you know the device’s remaining power at a glance. Simply tap the button to illuminate them. Here’s a very compact charger that will slip comfortably into your pocket or bag. It provides a single USB port rated at 2A, lined with enough juice to completely recharge your iPhone 6 Plus or a Galaxy S5 once over. You’ll also find a power button and a standard row of LED lights designed to give you an idea of the remaining power, as well as a built-in flashlight. Zilu promises at least 1,000 cycles and offers a two-year warranty with the device. You can also charge the it while simultaneously charging you smartphone if need be, and its available in a classic black, a two-tone pink, or even a white version if you don’t mind dishing out a couple extra bucks. The Micro USB cable for charging it is supplied, while the necessary port is located on the side. The curved, svelte design of the pastel-colored Poki makes it eminently pocketable (hence the name). It’s more attractive and more comfortable to handle than many of its competitors. There may only be one USB port, but importantly it sports a 2.1A output for relatively fast charging times. There’s also a Micro USB for charging it up. If you want to check the remaining power you simply slide your finger along the strip on the front and it blinks into life. It has an undeniably cool action that conjures memories of cylons and Knight Rider for this child of the ’80s, but it’s also pretty practical since it means no power is wasted to light up the LED until you actually want to check how much juice is left. It comes with an eco-friendly pouch, sporting an elastic closure. The only disappointment is the strange, incredibly short, flat, grey USB to Micro USB charging cable that comes in the box. This will comfortably charge an iPhone 6 or a premium Android smartphone twice with some battery left over. An extra $10 gets you the larger, 10,000mAh version. Featuring a brushed aluminum finish in black, electric blue, gold, or silver, the Hue Pro from Juno Power is quite eye-catching. Its USP is a built-in torch, which makes it a great choice for camping trips. There are two USB ports, one of them outputs 2.1A and the other is just 1A. The Micro USB port for charging it sits in between. There’s a backlit LCD screen that shows remaining power as a percentage, and it comes on when you press the touch sensitive power button. The torch comes on when you press it twice, which isn’t a great system. The rounded design makes it pretty comfortable to hold, but it is fairly heavy and bulky. You’re going to get around four full charges for an iPhone 6 out of this, and it should be able to fully charge a small tablet, like a Nexus 7 twice. There’s no carry pouch or cable supplied with this one. The smallest offering in the Zendure range manages to pack a lot of power into its compact frame. It’s a really durable, crush-proof design, so it’s a good choice for adventurers. There’s a single 2.1A USB port and a Micro USB port in the top. The USP for this is the pass-through capability that allows you to charge the Zendure A2 and a connected smartphone at the same time. There’s a small power button and four LEDs that light up to indicate what’s remaining. It turns itself on and off automatically when you plug in a device, so the power button is only for checking remaining juice. You get a short cable in the box with it as well as a cloth carrying pouch with a drawstring. It’s very portable and it holds a charge well. Zendure claims 95 percent after six months in standby. You can get larger sizes with greater capacity and more ports, but the A2 is ideal if you need a small, tough charger to give you a couple of full charges for your smartphone. This is a good looking, pocket-friendly solution to your battery life woes. There are two USB ports, one offering a 1A output and one with a 2.1A output. The power button brings the four LEDs to life; each represents 25 percent of the overall battery. It turns itself off within a few seconds if there’s nothing plugged in to charge. The pack will charge anything that can plug into a USB port and it takes a charge itself via a Micro USB port on the side (you’ll have to use your smartphone charger plug because there isn’t one supplied). All you get in the box is a USB to Micro USB cable and a soft, velvety, drawstring carry pouch. It’s comfortable to hold in the hand and fits easily in your pocket or in a bag. It also looks pretty good, with a brushed aluminum panel and your choice of white, black, or champagne gold for the plastic body. It will charge your Android smartphone two to three times over, or keep your tablet ticking for a few extra hours. 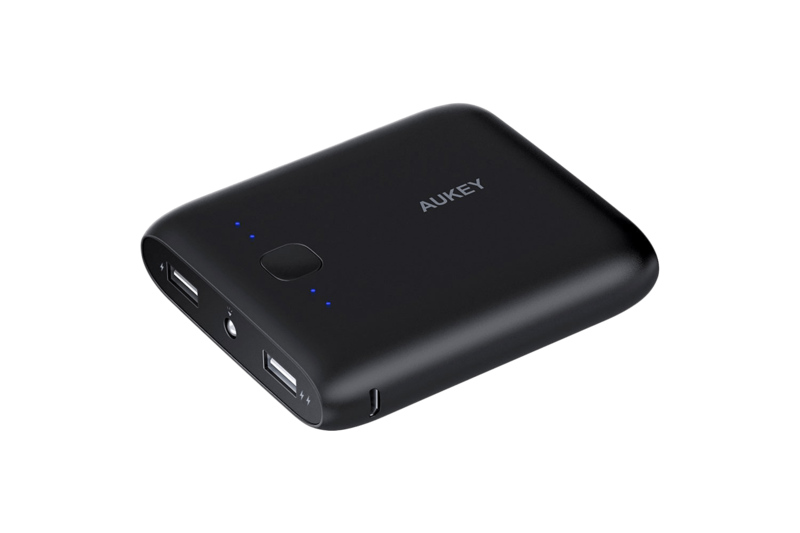 Overall this is a great value, portable charger for everyday use. It claims to be the smallest portable external battery with a 2.1A output, which means it can charge the latest Android smartphones at a decent speed through its single USB port. There’s a Micro USB port for charging it up and it comes with a cable, but no plug. There are three LEDs to show the remaining battery and it blinks when the charge is very low. You have to tap the power button to turn it on or check the remaining status, but you can also double click it to turn on an LED flashlight, which could be handy for campers. The Jackery Bar is genuinely portable and it will slip into your pocket or bag easily. It’s comfortable to hold and the aluminum helps to dissipate heat. You can get it in black, grey, or orange. You can get a couple of charges out of this for a high-end Android smartphone. This is a really good-looking, slim battery pack, with an eye-catching diamond pattern. It has two output cables built-in, a microUSB, and a Lightning cable. On the bottom edge there’s a power button, there’s also a third USB output port, and you’ll find a microUSB input port for charging the power bank. Both are rated at 2.4A. That means it can charge up fairly fast, six and a half hours to fully charge, and it can charge something like a tablet at a decent speed. This battery can actually charge three devices simultaneously, which could be extremely handy, though it’s worth noting that the total maximum output at any time is 3.4A, and the manufacturer recommends not trying to do this when the battery pack itself is plugged in and charging. The LCD shows remaining power as a percentage, remaining battery time, and current output. You can get it in black or white. It comes with a microUSB cable for charging, but you’ll need to pair it with a 2.4A wall charger to get those maximum recharging speeds. When you absolutely, positively gotta charge every device in the room, accept no substitutes. It’s debatable whether this is really portable, but the extra size allows an unbeatable 27,000mAh capacity and offers something that none of the other power banks in our list can — an AC outlet. You could plug a TV into this, but a laptop seems more likely and it will charge up the new 12-inch MacBook three times over. For phones it can charge up an iPhone 6S more than 10 times and a Galaxy S7 around 6 times. In addition to the 100W/0.9A AC outlet it also sports a Type-C port that can output at 3A, along with two traditional USB ports offering up to 2.4A each. You could charge a MacBook and two phones at once if you want to. You’ll find a standard LED array in blue to show remaining power, but there are 8 LEDs instead of the usual 4. It also has a DC input at 19V/1.6A to recharge faster, though it’s still going to take a few hours. This thing is pretty huge and heavy, but it’s a versatile beast and it has vents to prevent overheating. It ships with two Micro USB cables (one short and one longer), a power adapter, and a travel pouch. You’ll get at least one full charge for your smartphone from this power bank, and it will stretch to two if you have an iPhone. It can output up to 2.4A, so it will automatically pick the fastest speed for your device. It’s a pretty stylish, compact, and portable design with a metallic sheen on the aluminium alloy exterior that comes in black, red, or blue. There’s a power button up top and five tiny blue LEDs light up to show you how much power is remaining. You get a short Micro USB cable in the box with it and it charges pretty quickly as long as your plug it into a 2A charger. There is also an 18-month warranty. This is the biggest option on our list, and it stretches the term “portable” to its breaking point. But if you need a versatile solution that will charge your laptop, digital camera, and smartphone, then Maxoak’s offering might be perfect for you. All the ports are located at one end, along with an oversized power button and a four LED array that gives you a rough idea regarding the device’s remaining power. The charger is cumbersome and not exactly pretty, but its capacity is robust. You can charge an iPhone 7 Plus or a Samsung Galaxy S7 Edge more than 10 times with this external battery pack. You also get a smorgasbord of different connectors with it — 11 in total — allowing you to connect to a wide variety of laptops and notebooks. We suggest checking compatibility before you buy, however, because it does have some limitations. If you want to charge multiple devices at once, the Maxoak Power Bank can do it. There’s also support for pass-through charging, meaning you can charge a host of devices while fueling the charger itself. It comes with a power brick and cable, too, which charges rather quickly considering the capacity. You even get a bag with a zipper and a pocket for the adapters. Here’s an interesting portable battery solution that will suit frequent drivers. 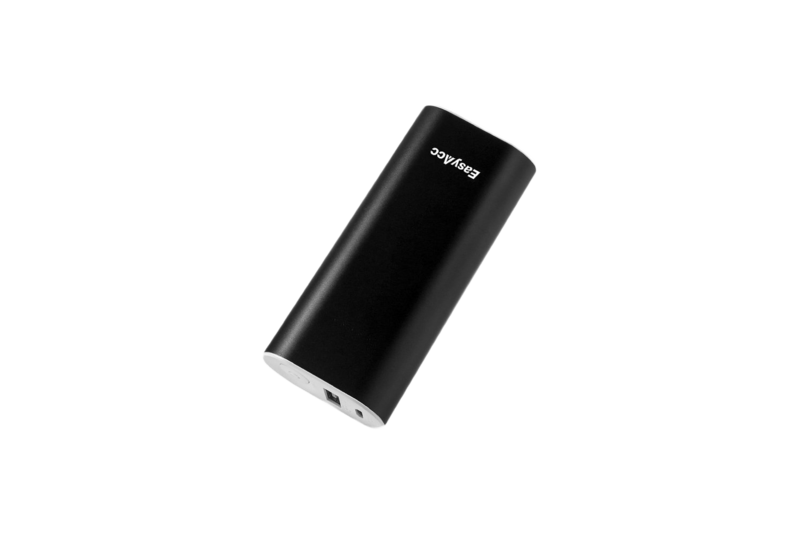 The Road Trip charger from Nomad is an aluminum cylinder, covered in black polycarbonate. There’s a 12V car socket plug at one end and a USB Type C output at the other. You’ll also find a USB-A output on the underside. The idea is that you plug it into your car socket and plug your phone in the other end. It will charge your phone first and then fill up the 3,000mAh battery. When you reach your destination, unplug it from the car and take it with you. There’s a power button to turn it on and four LEDs give you an idea of remaining power. You can expect to get a full charge for the iPhone 6 or 6S, and you can actually use both ports at once if you want to. It can split 3A between them, or deliver up to 2.4A to one. Unfortunately, there’s no cable provided in the box, which is a shame at this price, and you can only charge it up through the car socket. It also has a pretty low capacity for the money, but it’s a smart idea that will definitely appeal to some. This sizeable capacity is enough for more than three full charges of an iPhone 6S, or two full charges for a Galaxy S7. You’ll find two USB ports here, one rated at 2.1A and the other is 1A and you can charge two devices simultaneously for a combined output of 3.1A. Sadly, it lacks the quick charging present on some newer Aukey models. The AlPower technology automatically adjusts the output depending on your device, so it should still charge pretty quickly. The design is simple, lightweight, and impressively compact considering how much power it’s packing. It’s thicker than a smartphone, but it’s only 3.5 inches long and 3.15 inches wide. This will fit easily into a pocket or bag. It even has a wee built-in flashlight. Tap the power button on the top and you’ll bring the four LED lights to life, each representing 25 percent of the remaining battery. You get a 1-foot Micro USB cable in the box with it and there’s a 24-month warranty. Unfortunately, it does take around 8 hours to charge up, so you’ll need to plan ahead and leave it charging overnight before a trip. If you’re a fan of Niantic Labs’ Ingress this is going to prove irresistible, but even if you’re not, it’s a great-looking piece of kit. It’s an officially licensed product and it lights up with various color LED patterns when you use it (there are six in total). Fans will recognize the visual style from the game. It’s a really nice effect that makes this stand out of a pretty conventional-looking battery crowd. This portable charger doesn’t skimp in the performance department, either. It offers a whopping 12,000mAh of power and allows you to plug two devices in at once, though you might find it gets quite hot. There’s no need to worry, though, as Cheero has built in various safety features and it will automatically shut down if it gets too hot or any other problem occurs. It’s quite big and heavy, but the capacity is good, and the build quality is excellent. You get a microUSB to USB cable in the box and a wee carry sack. This one is obviously primarily all about the aesthetic, but Cheero is a solid Japanese manufacturer, so performance won’t disappoint. 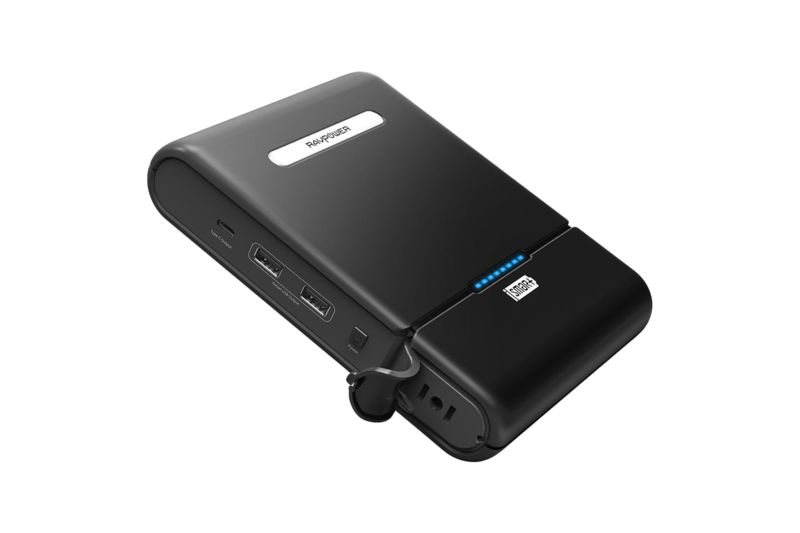 If you want something more portable with a higher capacity and a lower price tag, check out the Cheero Power Plus 3. The reduced price makes this a tempting prospect. It has two USB ports (1A and 2.1A), so it can charge two devices at once. You’ll find the micro USB port for charging it in the middle. There’s a power button on top, which brings a four bar LED to life to indicate roughly how much power remains. It’s a pretty bulky, plastic device, so it certainly doesn’t win on aesthetics, but it does hold a decent charge and you should get around four charges for an iPhone 6 out of it. It is quite heavy, so it’s not really a pocket-friendly option. You get a carry pouch with it, a Micro USB to USB cable, and a power adapter. You can get smaller versions of this with lower capacity for a bit less, but this one represents the best value for money in the IOGEAR range. Support for Qualcomm’s Quick Charge 3.0 standard means that this power bank can charge up a supported smartphone to around 85 percent in just 35 minutes. Sadly, there aren’t many QC 3.0 phones right now, but it is also backwards compatible with earlier QC standards, so you’ll get the fastest possible charging speed regardless of what phone you have. The second port can top out at 2.4A and has Power IQ to determine what speed to charge your device at. This is an impressively compact device considering the monstrous capacity, but it’s not something you’d slip in a pocket — it’s a bit too big for that. 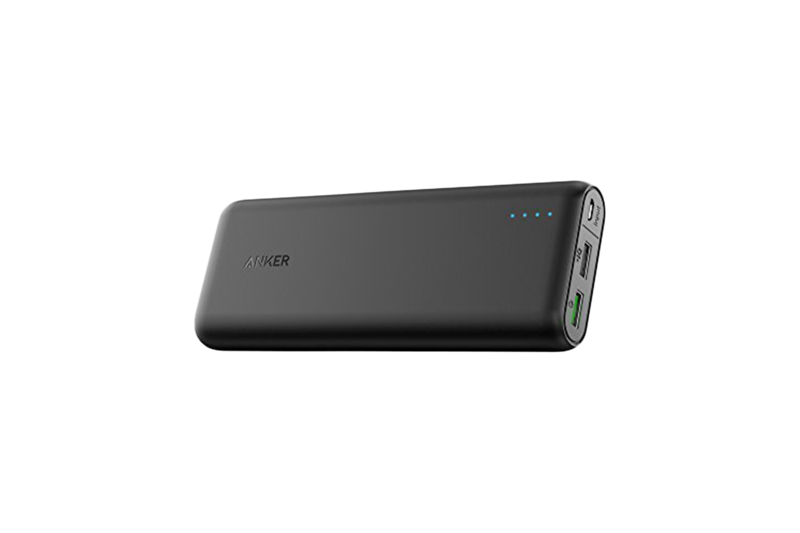 Anker has encased the battery in a rounded polycarbonate body that’s comfortable to hold and it’s also fire resistant and tested for impact, vibration, and extreme temperature. The capacity is more than enough for any trip. You’ll get five full charges for a Galaxy S7 out of this and it’ll even charge most tablets twice over. You get a Micro USB cable in the box with it and a handy travel pouch.